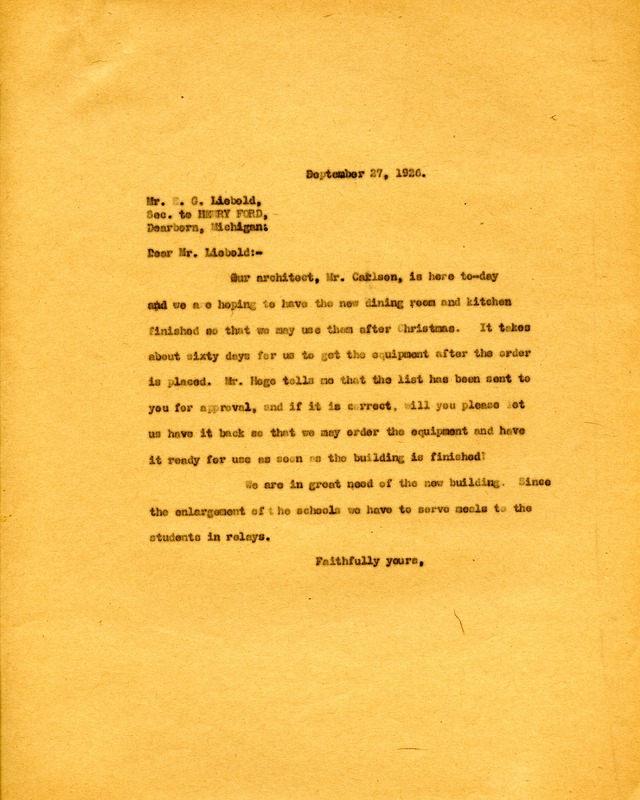 Berry asks Liebold, secretary to Henry Ford, to approve a list of dining room and kitchen equipment in order to have the rooms usable by Christmas. She is particularly anxious to have the new building in use because the recent enlargement of the schools has made it necessary to serve the students in relays. Martha Berry, “Letter from Martha Berry to E.G. Liebold.” Martha Berry Digital Archive. Eds. Schlitz, Stephanie A., Sherre Harrington, et al. Mount Berry: Berry College, 2012. accessed April 26, 2019, https://mbda.berry.edu/items/show/1872.